“Procurement refers to the process of finding, contracting for, and acquiring goods and services. One of those “goods” procured by municipalities is the food for vending machines and concession stands on government property; the meals served in employee cafeterias, schools, or senior centers; and even options provided at catered meetings and events. We all know that food, whether purchased for a municipality or one’s family, can add up to a significant monetary expense. Not as often considered, at least at the municipal level, are the calories associated with consuming the food – which can really add up as well….” Read more. "Older Americans are working longer, trying new things, and engaging in their communities. Municipal and county leaders can harness the ideas and vigor of the older adults in their communities to create age-friendly environments that will help their older citizens stay vital and remain healthy as they age..."
"From community gardens to bike-friendly streets, city planners and local officials play a vital role in designing a community that supports healthy lifestyles. Planning intentionally for an active community is more than a nice idea – it’s a quality of life issue that serves your current residents and an asset that will attract newcomers." "Municipal Workers who want to eat healthier need wholesome food choices where they work. Municipalities can create healthier food environments for their residents and government employees through their food procurement policies and practices. the city’s or town’s “purchasing power” provides an opportunity for local government leaders to adopt purchasing policies and practices that are in line with nutrition standards set by national health organizations....."
"Every City Wants a healthy workforce. It reduces health care costs, increases productivity, and improves morale. Recognizing that healthy people work in healthy places, municipalities are examining their workplace policies and practices and making changes that will promote healthy environments for their employees...."
"From the busy cities to remote rural areas, 1.7 million Virginians live in low income areas with limited supermarket access. The health consequences are well-known and affect the overall quality of life in a town. Likewise, communities without full service grocery stores miss out on job opportunities, local revenue and other benefits. The food desert crisis is on the state’s radar but it needs local champions to fight for funding...."
(L-R) Leesburg Town Council Member Katie Sheldon Hammler, Crew Town Council Member Phil Miskovic, and Richmond City Town Council Member Cynthia Newbille demonstrate that even a routine government meeting can be a healthy exercise. 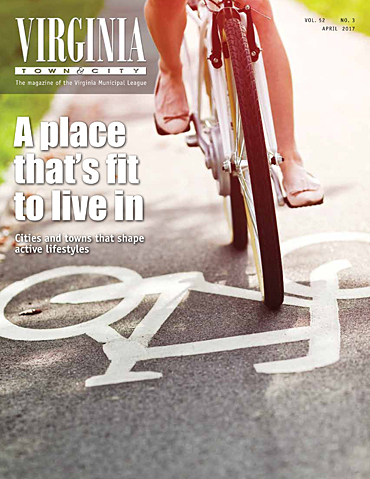 As the Healthy Eating Active Living Cities, Towns, and Counties Campaign for the Mid-Atlantic takes hold in Virginia, more and more local elected leaders are recognizing the importance of and intersection of local planning and health. As of April 2015, 14 Virginia cities and towns and one county have joined the HEAL Campaign. The Campaign’s primary partner in the Commonwealth, the Virginia Municipal League, featured the initiative in its most recent edition of its Virginia Town & City Magazine. This eight-page cover story reveals that while Virginia is not immune from the national obesity epidemic, local elected officials, not just health care providers, play an important role in combating obesity and related chronic disease. By shaping the environments in which community members and employees live, work, and play, policymakers help create spaces where eating healthy and being more physically active are routine elements of residents and employee’s lifestyles. Communities with healthy workers and residents lead not only to cost-savings from health care expenses, but to population growth and thriving economies. The City of Charlottesville understands the positive role that healthy eating and active living play in being a sustainable community. “Its helped show how how every decision we make has some impact on the physical well-being of our residents, and to make those decisions consciously in an effort to make Charlottesville a healthier place for everyone,” noted City Councilwoman Kristen Szakos upon adopting its HEAL Resolution. Mayor King and colleague Councilman Darrell Miller attended the May 2014 Complete Streets workshop sponsored by the Greater Washington DC Safe Routes to School Regional Network and the HEAL Cities & Towns Campaign for the Mid-Atlantic. This workshop featured a nationally certified Complete Streets trainer, as well as a panel of local experts from Maryland State Highway Administration, Metropolitan Washington Council of Governments, Maryland-National Capital Parks and Planning Commission, and Prince George’s County Department of Public Works and Transportation. At the workshop, participants were introduced to the concept of Complete Streets, and equipped with tools and resources to support their effort to advance a policy in their municipality within six months. Following the workshop, Mayor King participated in “office hours” phone calls, and worked with Greater Washington DC network and HEAL on various drafts of the policy. This post is cross-posted on the Institute for Public Health Innovation and the Greater Washington DC Safe Routes to School regional network websites. Recently, staff and elected leaders of nine municipalities from Prince George’s County and one from Wicomico County attended a National Complete Streets Coalition workshop to learn more about the steps needed to write, adopt, and implement an effective Complete Streets policy. The workshop sought to bring together multiple communities in order to capitalize on the strong network of cities and towns in the county, and create a network for peer support as communities work to adopt Complete Streets policies. The State of Maryland and Prince George’s County both have Complete Streets policies. Most of the communities in the county have state and county roads within their boundaries and some do not own any of their roads. The workshop attendees indicated they wanted their policies to align with the state and county policies. A Complete Streets policy will help these communities clearly articulate their commitment to multi-modal travel when the state and county undertake roadwork in their jurisdictions. Also discussed was the importance for a pedestrian or bicyclist to have the ability to easily travel from one community to another. For example, Mt. Rainier is known for public art and Hyattsville has an abundance of restaurants. These communities are adjacent to one another, but there is currently not a pleasant or safe way to walk or bicycle between them. Adopting Complete Streets policies will aid the communities in creating a multi-jurisdictional network that facilitates safe and easy travel for bicyclists and pedestrians. The workshop was co-hosted by the Greater Washington DC Safe Routes to School Network and the HEAL Cities and Towns Campaign of the Mid-Atlantic. Taking advantage of their related missions, the greater Washington DC network and the HEAL Cities and Towns Campaign were able to support communities with a pre-workshop Complete Streets 101 webinar. The communities will also be provided with technical assistance conference calls and webinars to ensure they have the support they need for policy adoption. Partnerships, both in hosting the workshop and in policy adoption, are a key outcome of the Complete Streets workshop. We look forward to many of these communities adopting Complete Streets policies in the future, and improving safety for walking and bicycling in Prince George’s County and the cities and towns within the county. This blog post is cross posted on the HEAL Cities and Towns of the Mid-Atlantic and the greater Washingington DC network websites.